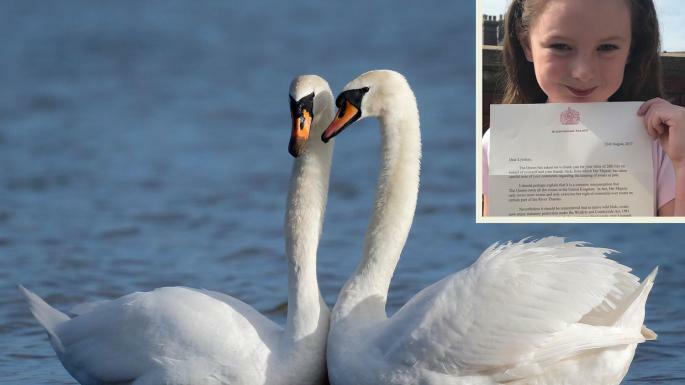 A five-year-old girl who wrote to the Queen to ask if she could keep a swan as a pet for the weekend has received a reply from Buckingham Palace. Lyndsay Simpson promised Her Majesty that she would look after the bird at home, and told her she would keep it in the bath. She decided to write her letter after her mother Jennifer Bax, 35, told her that the Queen owned all the swans. Jennie Vine, a deputy correspondence co-ordinator at the palace, thanked her for the request and said that the Queen had taken a “careful note” of her comments. Ms Vine said that the Queen was encouraged to hear of Lyndsay’s love of swans, and sent her a booklet on swan upping, an annual ceremony where the birds are caught, tagged and released. Ms Bax, from Petersfield in Hampshire, said that her daughter was delighted with the response. The family got a response in the post a few weeks later on August 23. While the letter did not address directly the advisability of keeping a swan in the bath, it went on: “It should be remembered that as native wild birds, swans now enjoy statutory protection under the Wildlife and Countryside Act 1981.